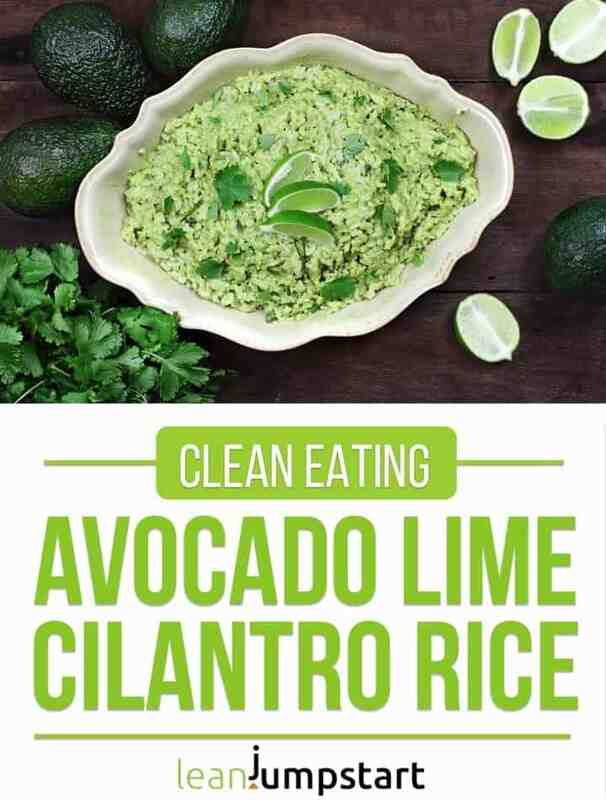 When I first tried this cilantro lime rice with avocado I was a bit skeptical, knowing that we don’t like the intense taste of cilantro too much. But as I had brown rice at hand I could whip up this high fiber meal with a huge salad as a starter in under 15 minutes. I’m so grateful that I tried it. This recipe was and is a real game changer for people like us, who think they can’t eat cilantro. It’s also a perfect recipe on times when you feel you urgently need to use up your avocados which otherwise would turn overripe soon. 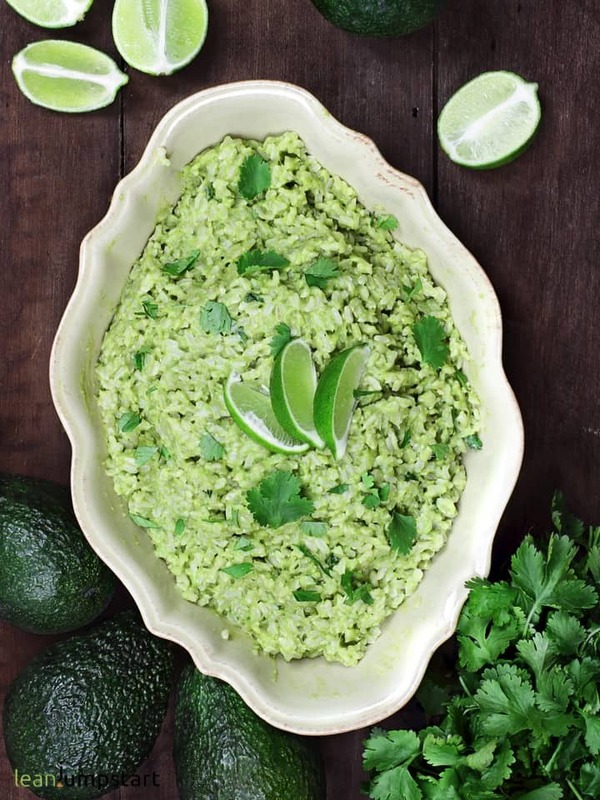 This simple and light avocado cilantro lime rice recipe by cookingclassy has saved me. Finally, I have an easy clean eating recipe at hand that inspires me to use up most of the herbs immediately when I get it. If you hope that cilantro loses its intense taste with this recipe I’ll have to disappoint you. But sometimes when you eat something often enough you start to appreciate its taste. It is similar like you can train children to love vegetables when you serve them often enough. Studies show that kids and adults who keep trying just a single bite of healthy foods they dislike will eventually lose that aversion. After sampling something three to five times, you’ll start to think, “This isn’t so awful”. In consequence, before you realize it, you’ll actually enjoy the flavor. Just keep trying the rejected food until you find it prepared in a way you really enjoy. That’s exactly what we experienced with this cilantro lime brown rice dish. 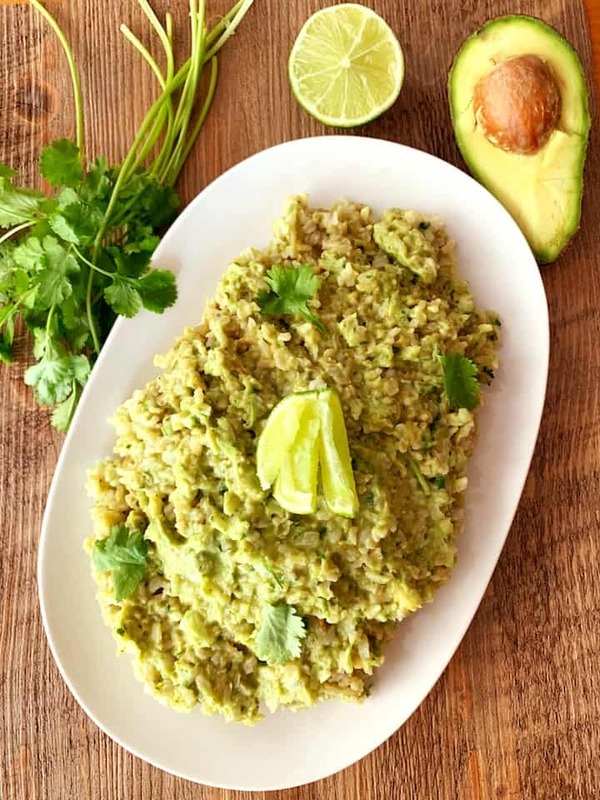 For us, cilantro combined with avocado, lime and brown rice is nowadays a perfect combination resulting in a yummy, vegan meal. It’s important to note that cilantro goes well only with a few herbs like cumin (see recipe) or mint. So for a tasty meal with coriander, you better don’t experiment with many other herbs. How to make the cilantro lime rice? This is just about the simplest little main dish to serve with a large salad as a starter or as a side dish on taco night. It will also make a great base for your burrito bowls or other Mexican foods. You just need 4 cups of cooked rice, which you stir well with a spicy avocado-herb-lime mixture. To prepare the herbs, you simply wash fresh coriander, shake dry, pluck off the fine leaves and chop. You can also chop the tender stems. Due to the whole grains, herbs, and avocados, you get a fiber-rich dish in a snap. Click through for more high fiber meals! So… what are you waiting for? Give this lean, plant-based recipe a try! In a blender, combine avocados, cilantro, lime juice, garlic, cumin, salt/miso and pepper. Use it as the main dish with a salad as a starter, or combine it with tomato salsa. An important base for this recipe is, of course, the brown rice which has got nowadays a bad reputation due to its higher arsenic content than white rice. Learn how to cook brown rice on the stove with the safest preparation method to wash out most of its arsenic content. Ok, I’ll tell you the secret, so you don’t need to leave this page. Just bring to a boil a huge pot with lots of salt water. Then cook your brown rice similar to pasta. At last, drain the water. You could also vary this recipe using milled grains with less arsenic content like basmati rice or jasmine rice. Other grain types with much lower arsenic content are bulgur, barley, millet or the pseudo-grains quinoa and buckwheat. I love to vary my whole grains as often as I can. If you can’t eat grains for whatever reasons you could even skip them altogether and use cauliflower instead. For this low carb recipe, you need a fresh head of cauliflower which you chop into florets and then add to your food processor. Process in batches until you get tiny little rice like pieces. Some people use a box grater to grate the cauliflower but this is less convenient. Then add your veggies to a pan with a bit of olive oil and cook for a couple of minutes while stirring. To get the texture you prefer, cover and cook for another 5-10 minutes. Now you can add your avocado mixture to the cauli rice and stir well. In case you are not sure if you should try this recipe maybe cilantro’s health benefits might convince you. Cilantro is especially known for its strong antioxidant properties that can guard you against the damage caused by free radicals in the body. Reasons for this are the antioxidants and the chlorophyll in the leaves. This superfood is also able to rid the body of the heavy metal toxins and keep the infections from arising again. It binds the molecules of toxins and heavy metals, such as mercury, and removes them from the body. When you suffer from anemia, add a handful of iron-rich cilantro leaves to your soup, salad or vegetables regularly. And last but not least cilantro also helps to settle nauseous tummies, prevent flatulence, and relieve indigestion. We all know the importance of proper digestion for weight management. Together with the brown rice, this avocado rice will keep your bowels moving. In consequence, you are less likely to become constipated. To come as close as possible to this popular Chipotle side dish, you just leave out the avocado in the mixture and use white, long grain rice. Not too fond of cilantro, in spite of all those mentioned health benefits above? Did you know that you can ask the crew at Chipotle to serve you the grains without cilantro? All you have to do is to ask! 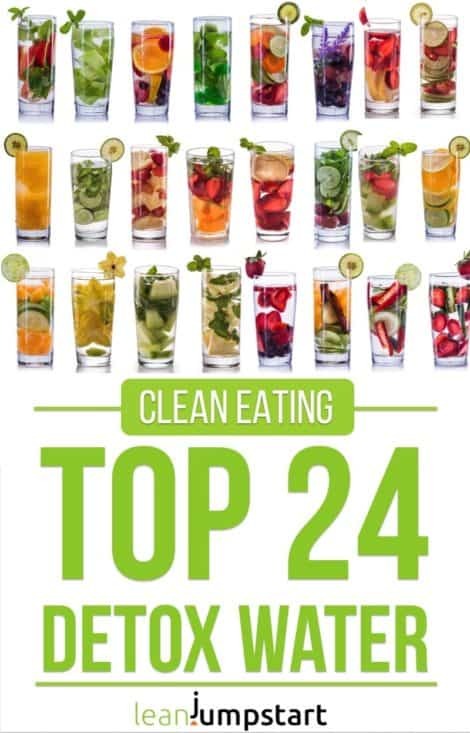 Did you know that cooking with healthy herbs is an integral part of my 52 Chef Habits Ecourse, including more yummy and easy clean eating recipes? Click here to learn more!